A year and a half ago I created Kate Spade inspired phone wallpapers. They were very popular and if you look in my sidebar, it's one of my most popular posts. I have had requests upon requests for me to create more wallpapers. I heard you! I'm going to release FREE tech wallpapers monthly! 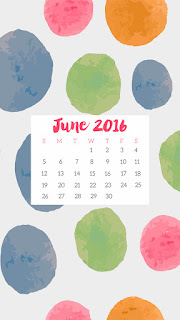 Since we're all about planners and productivity here, my wallpapers will have a calendar on them to coincide with the month. 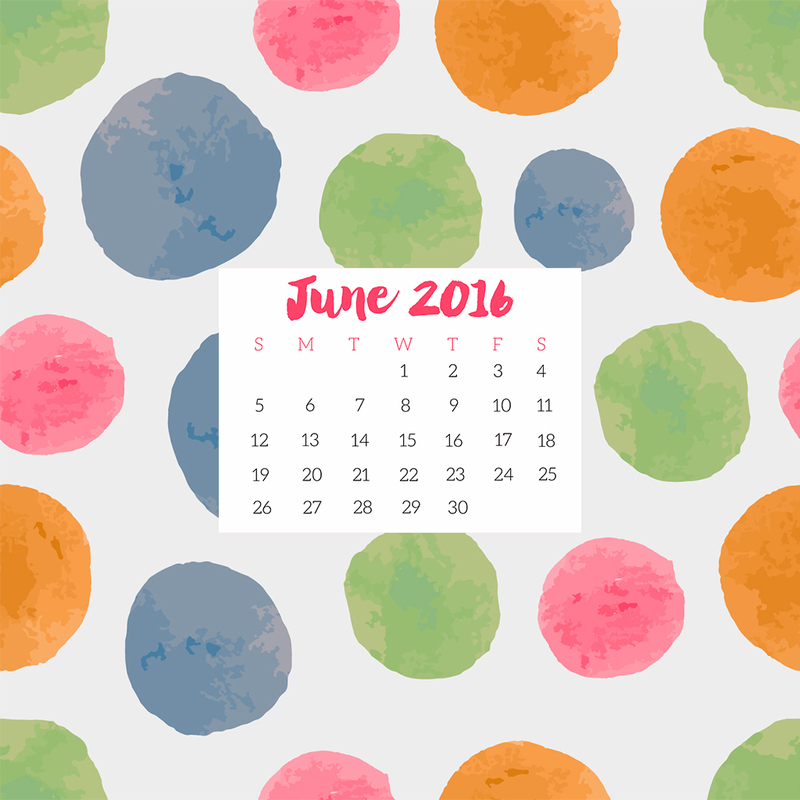 For June I thought a bright summery watercolor pattern would be perfect! You want to make sure you're viewing each image in full resolution prior to saving to your device. Each browser is different, if you have issues just let me know in the comments below and I'll assist you! I hope you enjoy the first release of monthly wallpapers! 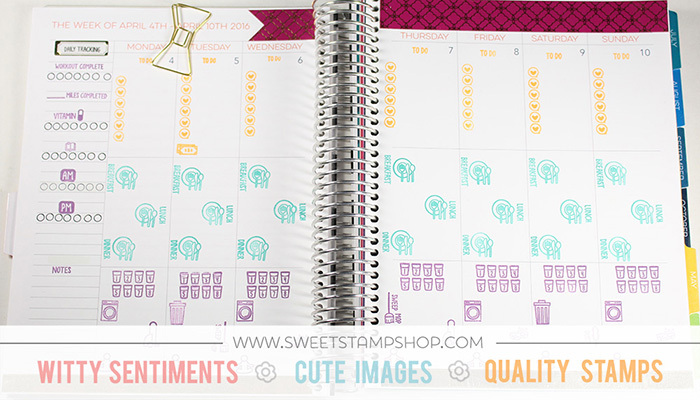 Today I was featured on the Sweet Stamp Shop blog sharing how I use their stamps in my planner. 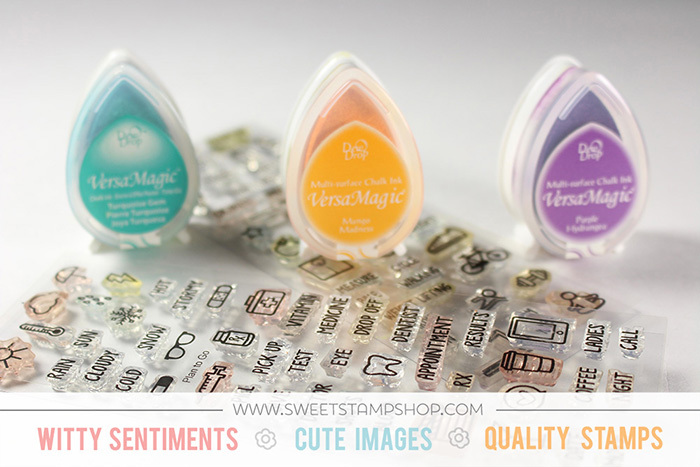 If you've been with me for awhile, you know that 95% of the stamps I use are from Sweet Stamp Shop. 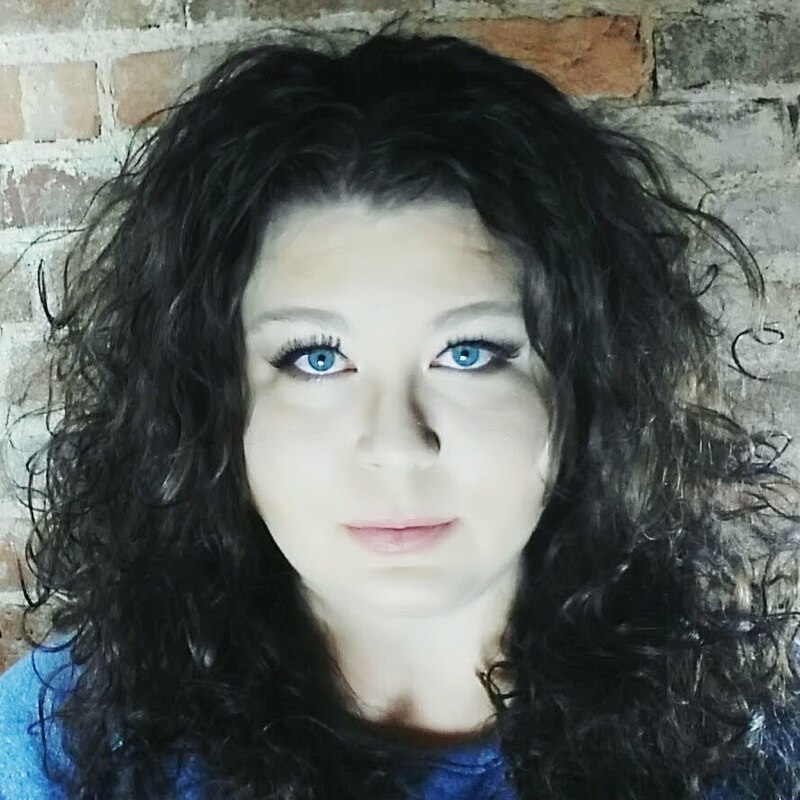 I'm honored to have written a post for them to share with their readers & customers. Be sure to go visit their website and show them some love. Below is the post I wrote for them! Stamping is budget friendly. I knew that this hobby could quickly consume me and my bank account. I thought about the best ways to cut corners and save money while fully enjoying planner decorating. For me stamping just made financial sense. Sure there’s a little more up front cost, but then that’s it. 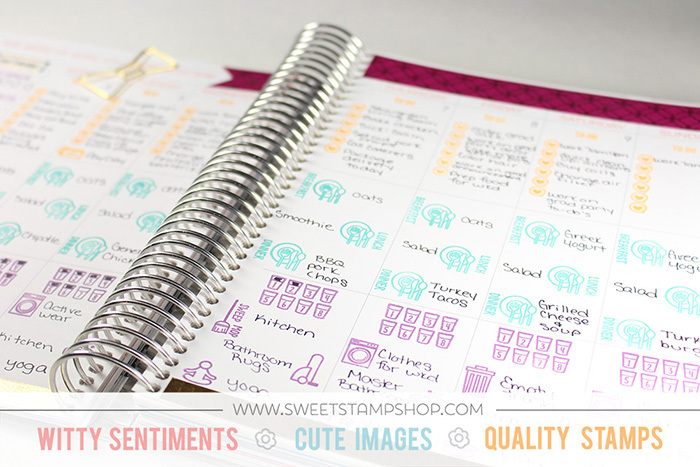 You’ve purchased your stamps, you purchase some ink, and now you can limitlessly create hundreds of planner spreads. 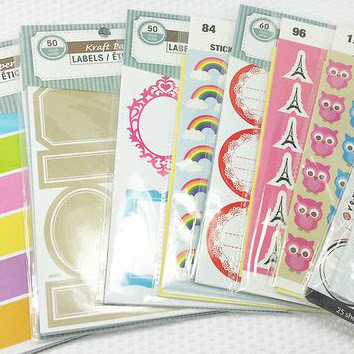 If you choose stickers, those are consumable. You use them once and they’re gone. This is why I initially chose stamping. I purchase stamps then they are mine. For forever. I have a plethora of color options to change things up each week just by choosing a different ink. That’s not to say that stamp buy doesn’t get addictive, because it can! I look at it as more of an investment in the hobby. It’s a tool much like your favorite precision scissors or laminator. Stamping looks clean! If you were to ask me the main reason I choose to stamp instead of using stickers, it’d be the aesthetics. This is my personal preference. I see full stickered pages in planners and I think they’re beautiful. However, when I try to do the same I always hate it. It’s too much for my brain to process when trying to focus on tasks. I am jealous of people that can use full stickered pages with no white showing, but I just can’t do it. I absolutely LOVE the clean minimalistic appearance of a stamped layout in my planner. I know one of the main draw backs to stamping is the time involved. With stickers you can just toss them on and you’re good to go. It’s not quite the same with stamping. There’s cleaning involved and inking and changing out stamps. It’s a process that takes a little longer. This isn’t a con to me, it’s a pro! 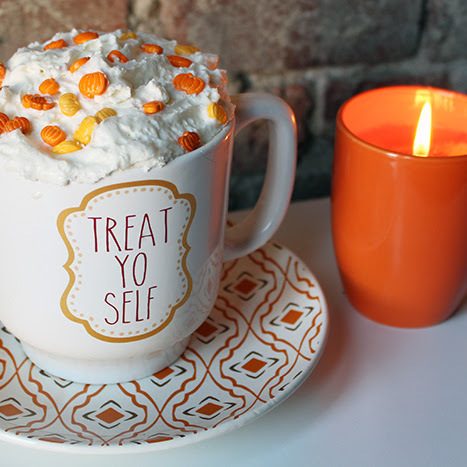 I love sitting down with a fresh cup of coffee, lighting my favorite candle, and taking this “me time” for myself. 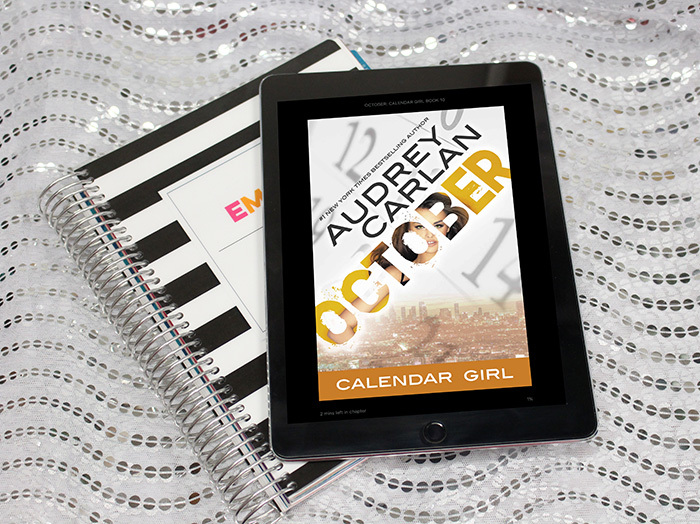 It’s a fun and relaxing creative outlet which I truly believe is the way most planner girls approach decorating in their planner. So why rush it? As a mom, a blogger, Etsy shop owner, and entrepreneur, I understand life gets busy. I do. Some weeks I don’t have time to fully decorate my planner and that’s okay! One of my favorite time saving tips is to purchase Avery repositionable labels and stamp on them ahead of time. 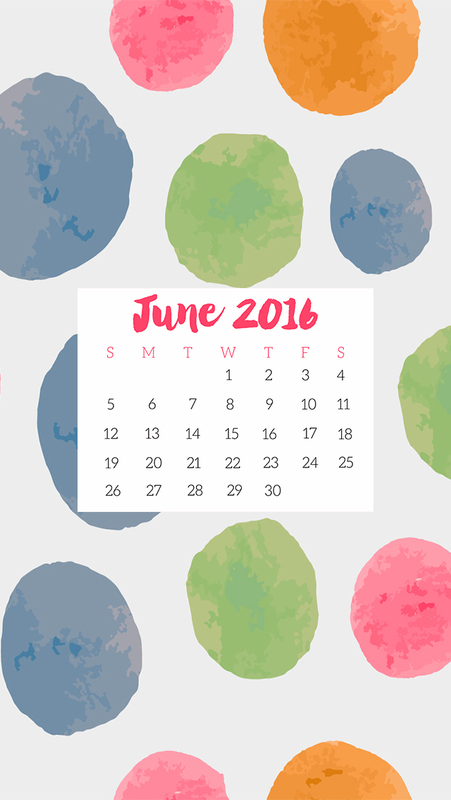 This makes it easy for weeks that I don’t have time to spend on my planner, but I still want it to be pretty. I currently use 2 planners. I have my spiral bound Limelife planner, and I have an A5 Filofax with Limelife planner inserts. I use my spiral bound for family, household, and personal things. I use my Filofax for business. I even use my stamps on my monthly pages. I primarily use my monthly pages in my spiral bound for financial planning. I also use it to notate when the cats need flea medication, when I need to change the air filters at home, and other monthly and seasonal tasks. 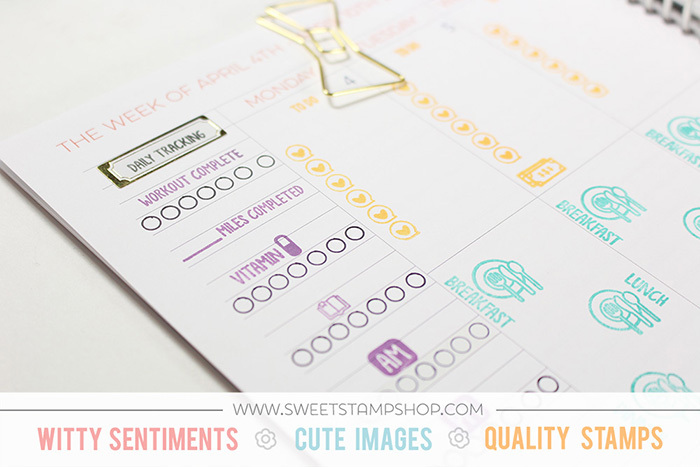 I love the Plan Home stamp set for this. I use the credit cards to notate when bills are due. I prefer using one icon for all bills so I can glance and know a bill is due. I DID use the dollar sign stamp from the set for notating pay days, but I dropped it and lost it. So I’m currently using the dollar bills stamp from the Plan to Eat stamp set. I’ve been tracking my water intake in my planner for a few years now. I use the water tracking stamp from the Plan to Eat set. 2016 is the first year I’ve used 2 different planners simultaneously. 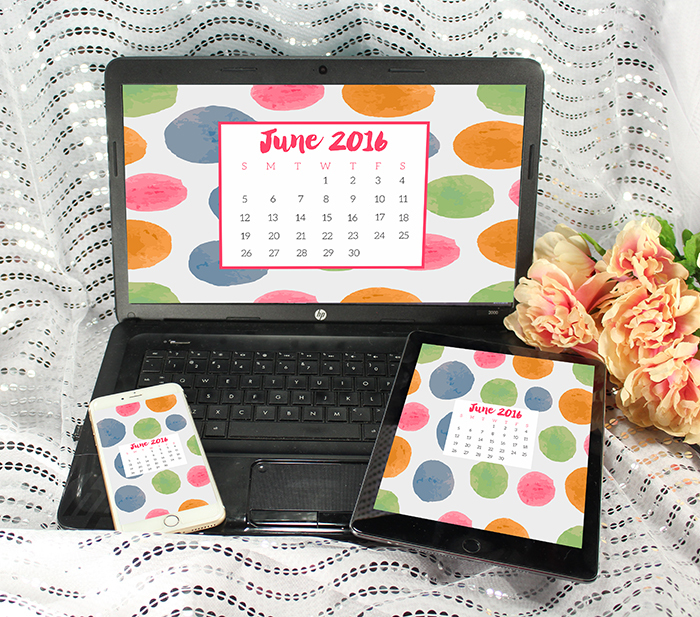 In the past I’ve crammed my personal, family, household, Etsy, blog, and YouTube all into one planner. 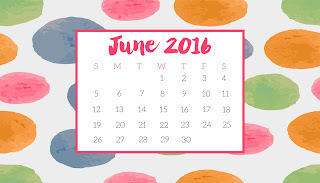 Towards the end of 2015 things started to get really crammed. Now that I’ve made the decision to have two planners and separate business from home, I am able to track more things than I had room for before. This includes our meals. I do this because we are REALLY bad about ordering take out. I want to be able to flip through and see how often we ate at home vs. ordering out. Since this is a bad habit we’re trying to break, I am tracking this with the plate & utensil stamp from the Plan to Eat set. This is basically what a full week looks like in my household planner before I start writing in it. In the sidebar I have my habit tracking: Workouts, vitamins, reading, morning, and night routines. Usually I reserve the top box for lists of random to-do’s that come up through the week after I’ve already stamped. For example, I’m currently planning a big Graduation Party for my son so I may find out through the week that I need to touch base with the caterer. So I’d write that in a top box where I’ve used a stamp from the Check It Twice set. I track our meals in the middle box section. Then the bottom is kind of a mix of what workout I’m doing [I had been sick so it was a light week with yoga across the board], my cleaning and laundry that needs done, and any other specific household tasks. This is how and why I love stamping in my planner. 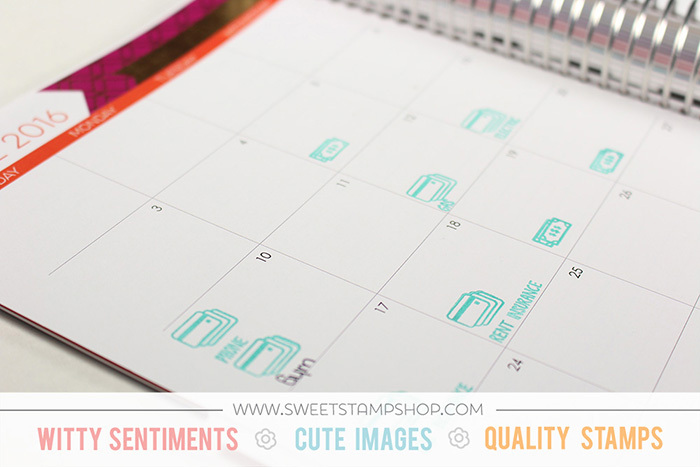 If you don’t stamp in your planner, I highly recommend you start! I bet you’ll just love it! 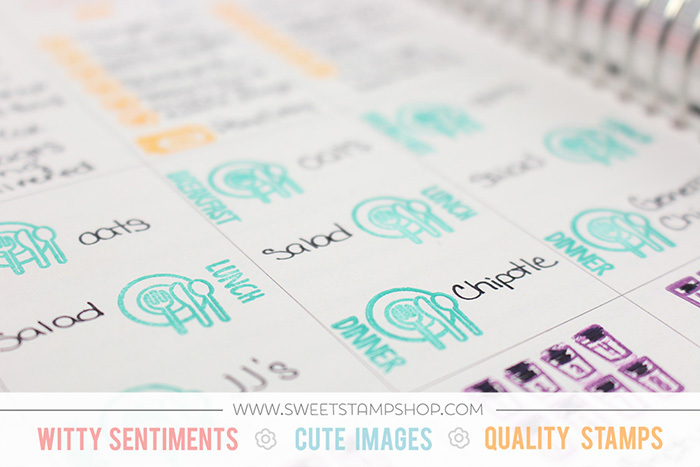 If you already stamp in my planner, I know you were nodding in agreement with everything I said, haha! So which are you? A seasoned planner stamper or a novice? Let us know in the comment section below, I’d love to know!